This single exposure turned out to be ‘right place right time’. I was on an early morning photowalk with a new photography friend, now friend, Mark Garbowski. Many of you know Mark from his blog, Too Much Glass and various and recent G+ photowalks. We met through an email introduction as I had been admiring his work for some time, bering from NYC and loving all that there is to shoot, I decided to reach out. We spent a couple of hours walking down 11th Avenue, it must have only been an 8 block radius we covered, but, there was an abundance of imagery to take in and shoot. Life on a sunny Sunday morning is very different than the hustle and bustle we feel everyday of the week running like gerbils on treadmills for work. The pace is different, the energy different, the scenery different, the activities different…the time to take photographs different. This was a really perfect morning to shoot. 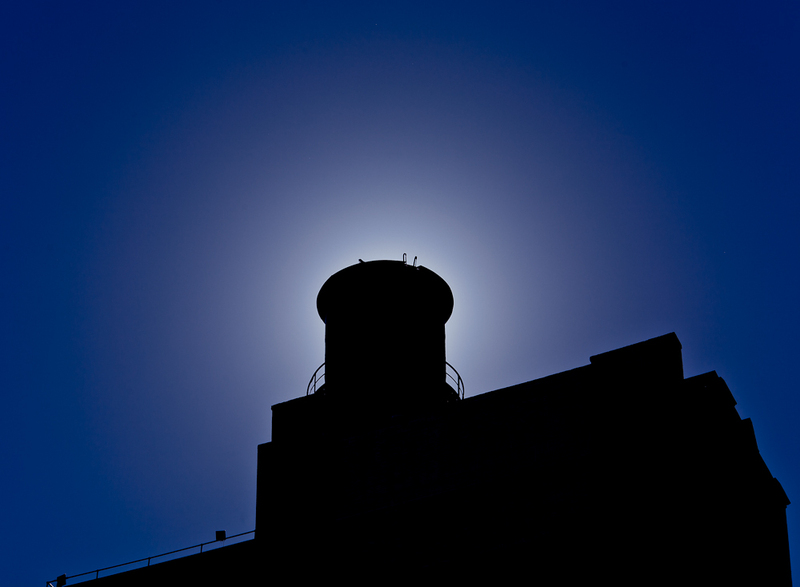 The sun was high in the sky, no clouds, and as I was walking down 11th Avenue, I turned to find this water tower seemingly eclipsed by the sun on the east side of the street. I really love the way the sky stands out against the image with the sun shining brightly behind it. Posted on Saturday, October 22nd, 2011 at 5:17 pm. Filed under: Architecture, New York City, Sky, water tower Tags: architecture, blue sky, New York City, NYC, sky, water tower	RSS 2.0 feed. Dig it Chris, really creative framing – love the glow! Great shot, really looks like an eclipse!